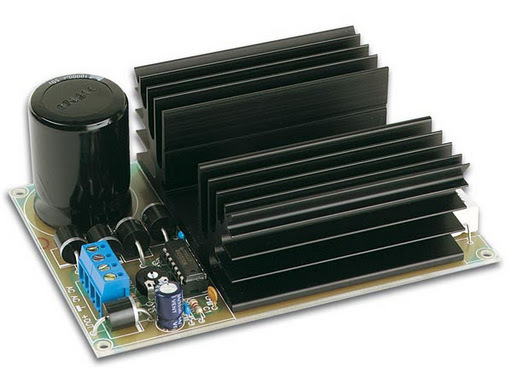 This power supply is meant as an auxiliary or as a permanent power supply for all common circuits based on a stabilized DC voltage between 3 and 30V provided that the consumption does not exceed 3A. Of course this power supply unit can also be used for other purposes. Be replacing the trimmer by a potentiometer, it may even be used as an adjustable power supply unit. A good quality heatsink must be used. If a metal housing is used, it must be earthed for security purposes. Make sure the cooling body does not touch the housing. This might cause a short circuit. If the circuit is to be integrated into another housing, it must be provided with ventilation holes (one may make these holes oneself), necessary for the release of the heat developed. Connect a voltage meter to the points ‘GND’ and ‘+OUT’ and adjust ‘RV1’ until the desired output voltage is reached. Apply some thermo-conducting pasta to the bottom side of the transistor and mount it on the heatsink.